There are those days when I feel so lazy to get out of the house to do anything. Well, make that most of the time *chuckles*. Yet we all have to eat yeah? So to compensate for those “lazy days”, I make sure that my fridge and pantry are well-stocked with ingredients which I may need to whip up something fast yet no less gratifying. As such, my fridge is always packed with food, and I often tell my friends that it is so stuffed that I have to be careful whenever I open it, or something would just drop out from somewhere. Friends laugh, dispensing it as a silly joke which I’d spun up but it’s true you know. Being a food hoarder comes with its own set of problems and fears. Some stuff are buried so deep within the abyss of other produce that they have to excavated. These “archaeological findings” usually take weeks and at times, months to be uncovered. Things which were once fresh turn stale and had to be binned. Wastage… But the greatest fear any food hoarder has is the day when the fridge decides to kick the bucket. That is sheer armageddon I tell you. And that happened to me just two weeks ago! My dad and I went to look for a fridge that same evening. Yes the day we ate two boxes of frozen scallops! The one we’d wanted wasn’t in stock so we had to settle for something else instead. Orders were placed and payment was made, waiting for the fridge to be delivered in a couple of days’ time. Alas, on the next day, after I’d cleaned out the guts of the old knacker, it decides to resurrect itself and sprang to life again! Hallelujah! Before long, it was spewing cold air once more, misty cool wafts cascading down the freezer whenever I open it. Now the joke is on me! The order for the new fridge was cancelled. Let’s just hope that the old fella would be kind and not die on me again. But firstly, I’d be kind to him by not stuffing him crazy anymore. Amidst all that drama, I’m glad that it ended on a positive note. Despite it working again, we spent the next few days clearing out more stuff from the fridge. Stuff which we’d not eaten in quite a while, stuff which we don’t think we would be eating for quite a while and stuff that shouldn’t be in the fridge, or need not be in the fridge in the first place. I told myself to be more discerning with my grocery shopping from now on. Hopefully with more exercised discretion, the fridge would last me for a couple more years to come…keeping my fingers and toes crossed. 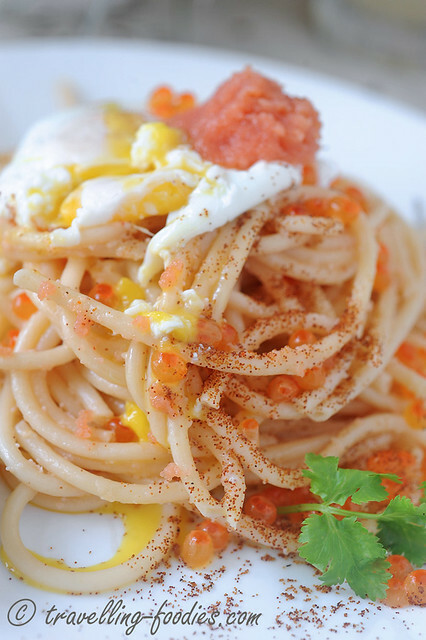 I’d cooked this Mentaiko, Ikura, Shrimp Roe and Poached Egg Pasta about a month back actually. A while before the fridge decided to go “kapoot” on me . And thankfully I did, because the frozen mentaiko and ikura would not have survived the ordeal of the meltdown. I was lucky to be able to expend the stocks for these what I deem as being “precious commodities” before I went through all that drama mama. Sounded quite an oxymoron I know but what would life be like without mentaiko and ikura, I cannot imagine. This pasta is very easy to make, needing only about 15 minutes to whip up a quick but not-so-light lunch. The name is quite a mouthful yes I know, but trust me, so are the flavours. It is packed with so much umami goodness from the sea that it is purely “orgasmica gastronomica“! 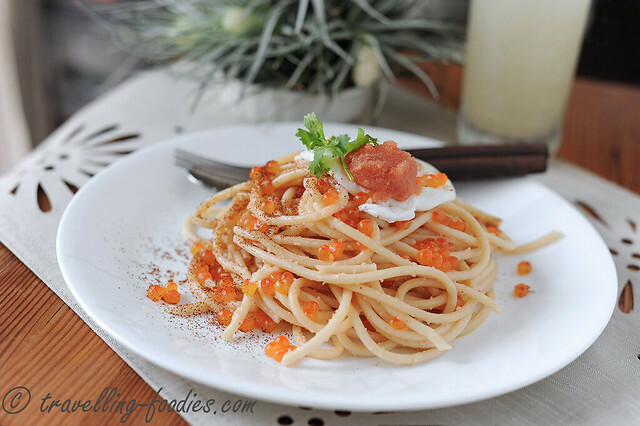 Mentaiko and ikura alone are enough to send any food lover to seafood heaven. What hits first is the aroma, from the roasted shrimp roe 虾籽 I’d gotten from Hong Kong, together with the wafts of the sea carried by the mentaiko and ikura. Imagine the juxtaposition of the larger ikura which pops in the mouth with every yielding of pressure between the tongue and teeth, exploding in the mouth sending an avalanche of flavours in all directions, while the small and beady mentaiko coax the tongue with their amazing palate sensation. The slight hint of spiciness from the ichimi used in the seasoning of the mentaiko raises the facades of the multitudinous dimensions the dish provides and as if the mayonnaise is not enough, I’d doubled up the creaminess for good measure with the runny yolk and just jellified whites from the poached egg, just to be doubly sure. To top it all up, a generous dusting of roasted shrimp roe escalates the amount of anticipated excitement from just preparing the dish and punctuates it perfectly in the end. The complexity of the components and hence the flavours may seem a tad too busy for some, but trust me, they are all relevant and coherent as a whole, maintaining some kind of gastronomic homeostasis that balances the dish beautifully. And yes… all accomplished within 15 minutes. First, get the pasta cooking, which usually takes 12-14 min depending on variety used. While the pasta is cooking, prepare the seasoning sauce. Mix all the seasoning ingredients in a mixing bowl and add 1-2 tsp of the boiling pasta cooking water to dissolve the sugar. Set aside to cool down slightly. Slit open the mentaiko roe sac lengthwise and carefully scrape off the roe. Add 1/3 of the mentaiko roe into the seasoning mixture and mix thoroughly. When the pasta is cooked al dente, drain the pasta quickly but thoroughly with a colander or sieve. Add pasta into the seasoning mixing bowl and toss to coat every bit of pasta with the sauce. Cover the bowl with a plate to keep warm. Add 1 tbsp of white vinegar the same pot of pasta cooking water and bring to a boil again before lowering flame to gentle simmer. Carefully crack an egg into the pot and swirl it around gently with a chopstick or fork until the egg is just poached. Plate a portion of mentaiko pasta and place the poached egg on top of it. 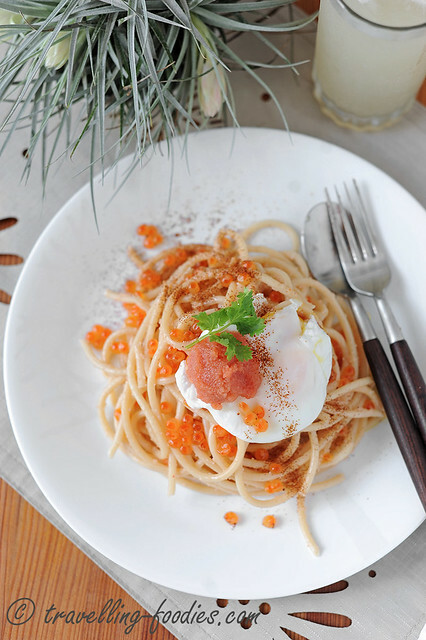 Garnish with a tbsp of ikura, a dollop of mentaiko, a dusting of shrimp roe and finally the poached egg. Repeat for second portion of pasta and serve immediately. This entry was posted on September 3, 2014 by Alan (travellingfoodies). It was filed under Food, Simple Eats and was tagged with ebiko, 虾籽, 虾子, fusion pasta, ikura, lunch, mayonnaise, Mentako, mirin, pasta, poached egg, sake, shrimp roe, spaghetti, sugar. 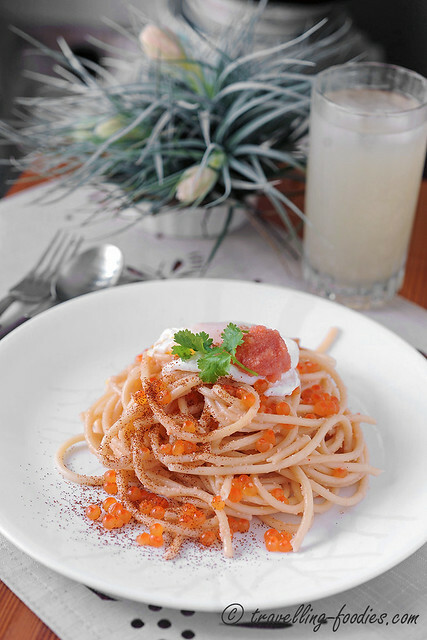 Hi, Your photo of mentaiko ikura pasta looks really wonderful! that i can hardly wait to make one. I am Shimoaoki, Japan importer and wholeseller of premium seafood selling at affordable pricing. I have mentaiko, Hokkaido Frozen shoyu ikura, Hokkaido fresh salmon, tuna, Red and white Sea urchin. Will you be interested? Currently, I do not have a website but I do have a Facebook page call Masamiya Gourmet. The company name is Masamiya Gourmet. Thank you for your message, Shimoaoki san. let me visit your facebook page and see how we can take off from there.